For those of you who missed it, local startups FwdHealth and Picture Wellness recently inked a deal linking their companies to a larger mission – corporate collaboration and community wellness. At CO.LAB, this announcement is especially exciting because each of these two businesses have origins in our Accelerator program. 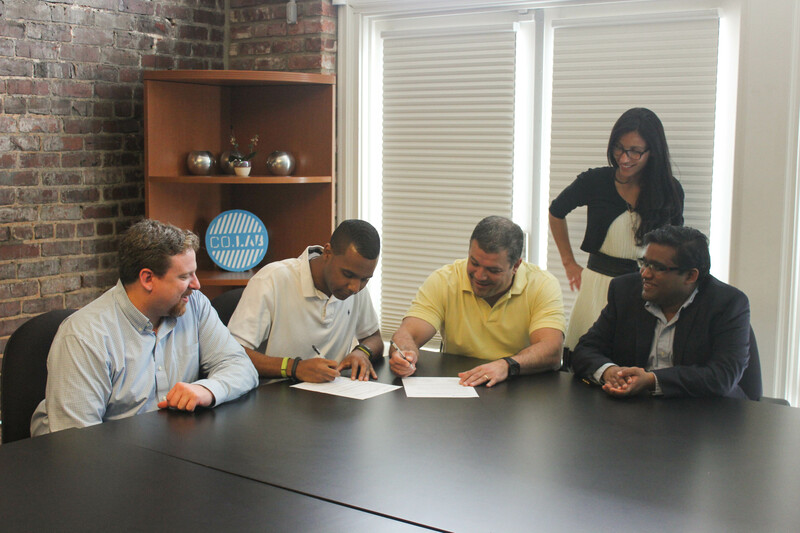 Shayne Woods, the CEO of FwdHealth, was a participant in GIGTANK 2013, and Maurice Saliba, CEO of Picture Wellness, was an original member of our Fall 2013 Accelerator. In light of their recent partnership, we thought now would be a great time to fill you in on the startups we supported through the end of 2013. Here’s your recap of all the great successes that came out of our Fall Accelerator. Of the six teams that entered the program, half found the proverbial pot of gold at the end of the rainbow – the much-coveted angel investment and initial funding of their ventures. As for the other half, one founder concluded that his business idea could not realistically achieve the goals he’d set. Another decided to bootstrap his business until it reached a point where a high-growth, fundable plan made sense. And last but not least, one other founder left the program to keep a focus on the core business while he continues to explore ways to grow his company at a pace that makes sense for him and his family. Every one of these entrepreneurs considers the outcome a success. The accelerator method CO.LAB uses requires founders to get out of their heads and in front of potential customers. Finding out that people aren’t buying what you’re selling, and doing so before you’ve sunk a large part of your life and cash into the venture, is as big a win as getting seed funding. It’s an even bigger win when founders and investors avoid funding a going-out-of-business model. It takes a particular kind courage and intellectual honesty to subject a passionately held conviction to the scrutiny of the marketplace and accept the truth it yields. We celebrate the founders who have the integrity to make the tough decision to take a step back. These entrepreneurs explore every available avenue to test the basis of their business model, to mount repeated excursions into the marketplace, and to perform rework after rework on their product and positioning. It’s often the case that after repeated iterations of the startup experiment, the facts simply don’t validate the assumptions. It takes an extraordinary act of discipline to reign in your passion and make a sober assessment of the business’s true prospects. Carbon launched in Fall 2013 with a mission to innovate in the fine art market. Through customer-driven development, the team of two created an iPad app and business model to improve visualization and sales for galleries and dealers in the high-end fine art market. They met their Series A angel investment goal in January, and they are currently testing the new technologies in a closed group. Carbon looks to launch publicly in Fall 2014. Click Click Boom is a mobile marketing company founded in 2013. CCB bought out their original investor at the beginning of the Fall 2013 Accelerator and, during the program, created a joint venture with one of its top customers, receiving significant funding and a strategic relationship with the partner’s sales organization. The other founders continue their work. One is exploring licensing opportunities, as well as a media sale that appears to be making progress toward a favorable conclusion. Another is seeking modest funding for a highly-capable 3D printer to produce specialty toys and figurines. And finally, one – the real hero of the class – is working to discover his next opportunity. CO.LAB continues to support these three founders as their exploration continues. We can’t wait to see what they come up with next.